Owned by KMN Racing and trained by Jerry Hollendorfer, Lutine Belle closed from sixth in a field of 10 to win the Blue Norther Stakes at Santa Anita by 1-1/2 lengths over American Sun and Rainha Da Bateria. 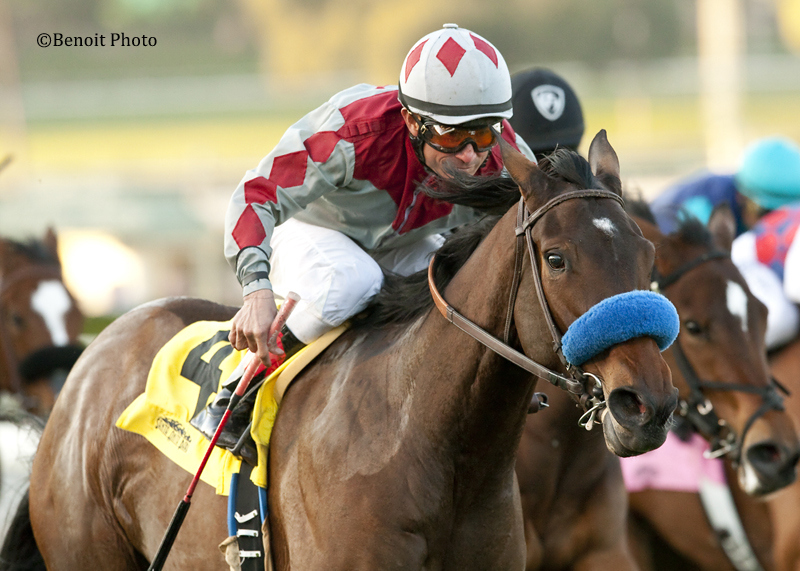 The win ended a 14-race losing streak for Solis, who won the 4,999th race of his career on Nov. 28 at Del Mar. By Bellamy Road, Lutine Belle has won 3 of 6 starts and earned $92,700. She was purchased for $40,000 at the 2013 Fasig-Tipton Kentucky yearling sale by a bloodstock agency operated by Solis’s son, Alex Solis II. The filly races for Kevin and Kim Nish of Fairfield, Calif. The stakes race was named for the top filly Blue Norther (1961-1972), who was undefeated in 5 starts as a 3-year-old, winning the Ashland Stakes, Kentucky Oaks, and Santa Anita Oaks. The aptly-named filly was by Windy City out of Wyndham (a blue norther refers to a swift moving, cold front marked by a dark blue-black sky and strong, wintery winds). The stakes is also a tribute to Blue Norther’s trainer, Wally Dunn. Born in 1911 in Manitoba, Canada, Thomas Wallace “Wally” Dunn was a lifelong horse trainer. He was one of five brothers who were involved with the sport, including Wilson Dunn, who bred George Royal, and George Dunn, who trained the 1965 Canadian Horse of the Year. Dunn moved his horses from British Columbia to Santa Anita in the 1930’s. His notable racehorses included Correspondent, winner of the 1953 Blue Grass Stakes and the 1954 Hollywood Gold Cup; and Colorado King, who won the 1964 Hollywood Gold Cup and American Handicap, while equalling the world record time of 1:46.40 for 1-1/8 miles. Wally died in 2004 at his home in Arcadia, Calif. at the age of 93.